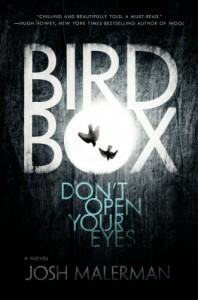 Bird Box: Or, the scariest book I've read in years. Every fall I read all the scary books that have piled up over the year(s), many of which are recommendations from friends and co-workers. And every fall I'm disappointed because none of them are actually scary. Not this year. This book actually scared the hell out of me. In fact, it had been so long since a book scared me that I forgot what that felt like - I have become so jaded that when people tell me they had nightmares or lost sleep I internally laugh. But no, this book actually gave me a nightmare, and the story stuck with me for weeks after setting it down. It was genuinely terrifying...and I loved it. This was another book I went into without knowing anything about it, and once again I'm glad. As the story of what happened before is slowly revealed at the same time as the present action it only made the events more frightening. You knew things were going to go badly, but you didn't know exactly how or why, which added to the suspense and tension. The idea of there being something out there that could hurt you if you so much as looked at it, and having to keep your eyes shut while horror unfolds around you, is so unbelievably frightening. The sense of vulnerability and helplessness is palpable. In a way it mirrors the concept of unseeable and unknowable terror that Lovecraft favored, except actually executed with adept craft and striking results. I will say that I had mixed feelings on the ending, but after a few weeks I've warmed up to it. I'm afraid that if I say more it might water down the joy of reading this book for the first time. If you've been looking for something genuinely frightening you owe yourself this book. If you scare easy know this might push your buttons, and steer clear if you don't like being frightened - this one will actually have you jumping at shadows. I for one feel like this is the book I've been searching for, for many years, without even realizing it.